The development of industry in our country in the mid 30-ies of the last century entailed the growth of cities, and in these conditions all the more urgent became the problem of their passenger traffic. The most rational in this situation was the creation of bus routes mobile and, unlike the tram, does not require the laying of tracks and the contact network. The main buses in that time was the ZIS-8, I-6 and later ZIS-16, were designed using the modified chassis of a standard truck, little suited for passenger cars, and come close (because of the traditional bonnet layout) wooden body. The ratio of the useful and the full areas of this bus was not more than 0.75. Insufficient engine power and weak brakes with a mechanical drive is not provided by the dynamic acceleration and deceleration of such a bus is needed when driving on city routes with the usual interval between stops of 0.4 kilometer. Hard (“cargo”) the suspension is not able to provide passengers with the necessary comfort, and the driver — normal working conditions. Besides the standard manual transmission required the driver execution for a shift of several thousand tedious operations of the clutch and gear shift, led to unpleasant tremors in the movement and uneven loading of the engine. The output could look only to create a city bus a fundamentally new wagon that increase the utilization of usable area up to 90 percent, and on a dedicated chassis with a more powerful engine. Prototypes of these buses were built in November 1937, at the research Institute of urban transport on the basis of ZIS-8 (there was only the body and front axle from I-6), and then, at the end of 1938, in the Scientific-research tractor Institute under the brand name NACHI-A. 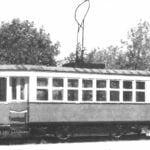 the Latter had a metal monocoque, with a capacity of 60 people (40 seats), a new 6-cylinder overhead valve engine MB-27 power of 114 kW (155 HP) located in the back across the car, and brakes with pneumatic drive. Experienced wagon buses were created in 1941 for Gas (GAZ-71) and ZIS (ZIS-17). The advantages of the new machines, despite certain shortcomings, was undeniable, but in that tense prewar time, the industry did not have the necessary resources and work areas for their production. In 1945, the increased capabilities of the domestic automotive industry, the urgent need of urban passenger transport in a new, more efficient rolling stock for the growing post-war public transportation, as well as the obvious successes of the foreign bus created by the time a number of progressive structures, forced the leadership of ZIS to engage seriously in the development of fundamentally new urban bus average capacity with all-metal monocoque body rolling-type diesel engine and electric continuously variable transmission, like most modern passenger cars in the us city of GMC firms (with hydraulic assist) and Mack (with electric transmission). Big city bus GMC with a highly distinctive, fashionable in those years, the United States form the wagon body, arrived in the USSR in the end of the war. In the summer of 1945, the car was sent to the Saratov aircraft factory No. 292, where it is carefully measured and produced all the working drawings bearing aluminum body, its constructive force diagram similar to the fuselage of the aircraft. Then at Tushino aircraft factory No. 82, using the exhaust in aircraft lofting template method, produced according to drawings all the aluminum body parts of the future of the bus and tooling for production and Assembly of the first body on the VMS. In March 1946, after the generalization of the accumulated material and conduct the necessary research started to design a new machine that received the mark of the ZIS-154 (chassis — ZIS-122, the body — ZIS-190), and in may in the body shop № 2 was organized by the special design Bureau of buses under the leadership of engineer A. I. Israel-Sergieva. In the design of the ZIS-154 was attended by designers, G. I. Goldberg, N. In.Kugel, E. A. Stepanova, V. 3.Kiselev, T. V. Potanin, V. A. Prokofiev, R. G. Piscopal, p. P. Chernyaev, L. F. Rogulsky and others. Built test samples was conducted by G. V. Bitt, M. O. Friedman and A. I. Yermolayev. Work has been carried out on a broad front with the involvement of many organizations. He soon determined the basic parameters of the new city bus: number of seats (including the driver and conductor) — 36, 62, maximum — 75, curb weight — 8000 kg, machine length is 9500 mm, width — 2500 mm, height 2900 mm, base — 5460 mm, maximum speed — 65 km/h, tyre size — 10,50—20″, minimum turning radius of 10.5 m.
The powertrain of the new bus are located transversely in the rear part thereof two-stroke 4-cylinder diesel engine yaz-204D (bus modification new for our industry, diesel engine yaz-204, analogue GMC-4-71) with a power of 82.4 kW (112 HP), which was prepared to manufacture at the Yaroslavl automobile plant (for truck yaz-200). And the main elements of the front and rear axles, propeller shaft, springs, steering and pneumatic brake system was unified with the new truck ZIS-150. The plant had practically no experience creating load bearing sectional car bodies from aluminium alloys. This had to involve specialists of the aviation plant No. 82. In the design used was extruded aluminium profiles and steel frames. Main load-bearing elements of the body and their materials were able to partially unify with the body of the new trolleybus, tram and bus experienced the Gorky GAZ-635. The front door was made in the front of the machine next to the driver, which allowed him to observe the landing of passengers. The door had a pneumatic control. The body of the ZIS-154 was calculated for the mass passenger transportation for the term of its amortization eight to ten years. He was to be the base for subsequent family different buses by simply changing the number of sections. The new plant became and an automatic continuously variable transmission, now used in domestic bus production. She drove the machine only to manipulation of the accelerator and brake, greatly improves the smoothness, allowing better use of engine power and eventually increased safety, since the driver is less tired and could now only look at the road. Moscow plant “Dinamo” named after Kirov (chief designer A. A. Rabinowitz), in collaboration with research organizations in a short time created for the new bus traction generator type DC-505A-hour capacity of 50 kW and motors DC-305A hour capacity of 43 kW, is also largely uniform with a new series of traction electric motors for trolleybuses, trams and metro (chief designer A. B. Joffe). Unfortunately, due to lack of experience and flexible means of regulating the parameters of electric machines was not chosen very well, which subsequently did not allow to optimally coordinate their work with external characteristic of the engine to use it and so not quite enough power. 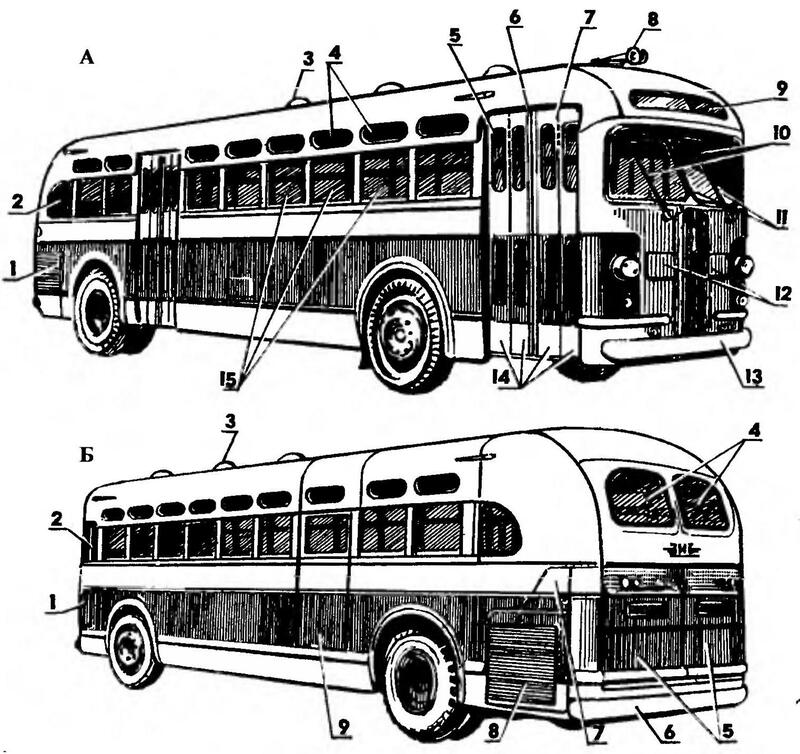 The bus design was used and the other new elements, later became widespread: a powerful hydraulic shock absorbers front suspension, the radiator surge tank, automatically controlled blinds radiator (with pneumatic actuator), a hydraulic actuator of the accelerator pedal (on machines of the first series), beep overheating of the engine, the damper of the fan, the piping connections type “Parker”. Later was introduced the mode switch of the transmission, allows you to choose a more dynamic urban driving mode or a more economical holiday. Work on car was carried out quick, just the front-line rates, which are already used at the plant. 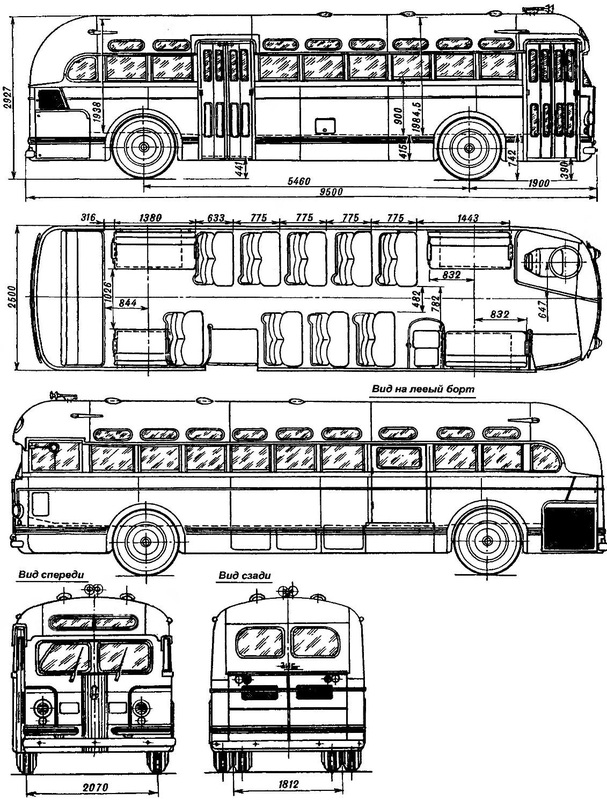 The bus design largely ended in mid-November 1946, and on 8 December was the first bus. Six prototypes began to be exploited on the streets of Moscow on 8 July 1947 on the route the Revolution Square of the Belarusian station. On the day of the 800th anniversary of Moscow, 7 September 1947, they were joined by another 25 cars, all in 1947 built the 80 buses. Due to unreliable operation of the diesel engine yaz-204D on the first 75 buses were installed on the engines GMC-4-71. From the end of 1947 began production of small series of ZIS-154 for temporary technological processes in parallel with the factory research and in close collaboration with the operating organizations that fully justified itself as a method of fine-tuning a new car in a short period of time. Defects are usually eliminated on the machines of the same series. During 1949 were held by the state of the test bus ZIS-154, the results of which the State Commission recommended it for serial production, though in fact it was produced for two years. By that time (1 October 1949) 817 buses worked in 64 cities from Odessa to Magadan, as well as abroad. Only one in 1948, they were released 404 of the instance, and in 1949 — even 472. Enjoy the car for your passengers unprecedented comfort (smoothness, soft and comfortably positioned seats, wide doors and passage in the cabin, ventilation and heating of the body, good afternoon and evening light) and the operator for ease of control, maintenance and repair. With the transition of the parks on new buses dramatically increased the efficiency of use of rolling stock on the line. Compared to the pre-war city buses curb weight of the ZIS-154 per person at the maximum capacity has decreased from 102-105 kg to 80 kg, and the total length — with 170-184 mm to 95 mm. by 30 percent improved maneuverability and 25 — visibility, which is very important in urban environments. On highways with intense traffic, a new bus was definitely cost-effective (cost of operation it decreased by 25-30 percent compared to ZIS-16). Runs before overhaul began to reach 150 thousand km (except engine), depending on the terrain, the average operating speed in cities was from 19 to 30 km/h (speed of the trolley MTB-82) and meet the requirements of intense urban charts. Operation showed that passengers often prefer the ZIS-154 other modes of transport. Loved the new bus and the drivers the ease and convenience of management, comfort in the workplace. They are less tired by the end of the shift compared with those who worked on the old ZIS-8 and ZIS-16. But these machines was still a lot on the lines. In the production process, the bus from series to series continuously improved: increased reliability, durability, ease of maintenance, dynamic quality, the starting properties. However, against this background, more and more clearly manifested its weaknesses, first and foremost is the poor performance of a diesel engine yaz-204D, debugging which the Yaroslavl plant was delayed. Breakage of piston rings, pistons burnouts, cliffs injectors and cylinder liners, cracks in heads, blocks have added support for the operators, and the noise of the engine and its smoke seriously alarmed the city authorities. The buses ZIS-154 gradually began to transfer to suburban and country lines. The plant tried unsuccessfully to replace diesel yaz-204D dual installation standard gasoline engine ZIS-120 (even built on their basis a boxer 12-cylinder ZIS-122Б) power 132,5 kW (180 HP) or de-forced version of the engine of the car ZIS-110 with an output of 77 kW (105 HP). The latter was equipped with about fifty buses ZIS-154 (chassis ZIS-122A), but this engine spent a lot of fuel and quickly failed because it was not designed for constant high load. Other suitable bus engines was not. Clearly revealed is not exactly a good combination of engine performance and related electric machines, in particular double-winding alternator with self-excitation, and their lack of power. When pulling away there often were “lapses” in operation of the transmission. Fatal defects were overloading the front wheels, “squeak” brake and rapid wear, poor ventilation and high dust located on the rear of the engine compartment, the lack of effectiveness of air filters. The location of the entrance door before the front wheel often led to accidents among the passengers when starting off a crowded bus. Thus, the progressive ideas and solutions underlying the design of the machine is clearly ahead of its time and was outweighed by certain design errors and defective execution of a number of units. Apparently, the industry has not yet reached the technological level required for the production of these promising city buses. 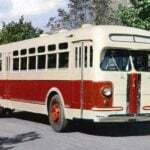 Ultimately in 1950, the bus ZIS-154 was discontinued (it is dated 1165, subject made in 1956 sample sanitary bus), and the plant switched to production unified with him on most elements of the body, but it is significantly smaller (28-seater) and more ordinary city bus ZIS-155 (in the main units of the chassis of the ZIS-150) with the usual speed manual transmission. It was definitely a step back, because even released in 1957 with a larger, upgraded ZIL-158 did not give reason to believe all these cars full of city buses. They caused fair complaints of passengers and operators. Interestingly, in the late 50-ies, when the diesel engine yaz-204, finally, developed, and its reliability is not satisfactory, the management of passenger vehicles began to track down surviving buses ZIS-154. It turned out that by simple modernization and regulation of number of units held by the bus parks, the car gained satisfactory performance. In particular, the installation of a 6-cylinder diesel engine yaz-206 power 121,4 kW (165 HP), it is located in the engine compartment, significantly improved acceleration of the bus, increased reliability, and also allow to eliminate smoke and reduce fuel consumption. Particularly well modernised ZIS-154 showed itself in the work on the complex relief lines. And again old ZIS-154 was out of competition than for a long time retained a good memory. Only the emergence in the late 1967 on the city highways, progressive by design, the LiAZ-677 has allowed domestic bus production to exceed technical and performance level achieved back in those early postwar years, our first born, ZIS-154. 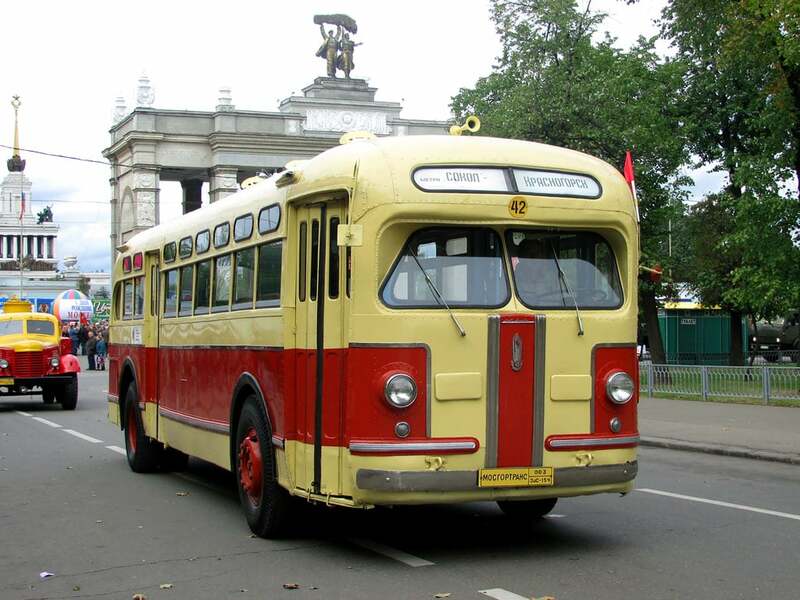 The only surviving full copy of the bus ZIS-154, restored by enthusiasts literally from scratch and brought up to standard and healthy state, is in the collection of the Moscow Museum of urban transport. Bus ZIS-154 was designed for urban routes with large passenger flows in large cities that have a roadway paved and climbs, not exceeding nine percent and for work on suburban lines with a length of 100 km. The back of the bus — carriage type, with a rear transverse power unit. The cabin is fitted with ten double soft (spring), plush seats; three triple seat (sofa) on the wheel covers and one five-seater rear seat is a mere 34 seats. Separately — folding seat the conductor in the front and adjustable in height, horizontal position, tilt adjustment backrest and cushion driver’s seat — in the cockpit, separated by a glass partition from the salon. The normal capacity of the cabin (with standing passengers) — 60-62 man into Overdrive — up to 80. Entrance through the front of a four-door with a width of 690 mm and a height of 1925 mm, exit through the back door with a width of 735 mm the same height. The door was controlled by the driver via a remote pneumatic actuator, introduced for the first time in domestic bus production. Pneumatic cylinders — speed (differential) regulation of priority modes and response time. So as not to spoil the clothes of the passengers, sash doors opened to the inside of the body. For emergency exit from the vehicle, and for loading the stretcher when you use a city bus as an ambulance (special period) there was an emergency door width of 845 mm on the left side. Ease of entry and exit, and provisions for standing passengers in the cabin contributed to numerous chrome-plated handrails. Ventilation — ceiling, six adjustable holes with protective fungi and deflectors. Additional ventilation through the lifting side Windows (eight on Board) and due to supply fresh air to the ventilation duct running along the left side. Front (wind) and a rear window blind for ventilation but the front of the cabin additionally served two hatches on the rear panel of the body. In the winter the cabin was heated with three liquid heaters of the radiator type, connected in parallel to the engine cooling system. The circulation of warm air using fans. Front glass is forcibly blown with hot air from the heater in the driver’s cab. Two wiper front Windows had driven by a pneumatic system. The salon was covered by 16 ceiling shades, there was individual lighting of both steps. In addition, until mid-1949 were installed on the ceiling, illuminating at night the sidewalk in front of the footrests. Exterior lights were richly represented front molded sealed lamps-headlamps with dvuhvetvevym lamps and low beam headlamps (50 and 21 candle), and the low beam light bulb when the resistor is provided and Parking light; rear red lights with dvuhvetvevym lights (rear light and the “brake light”); the two front (green) and two rear (red) marker lamps; route light (above the windshield); front and rear turn signals (with hands on glasses). Cyclic mode “flashing” they have not yet had, but that drivers sometimes did manually. Audible alarm consisted of electrovibration dual-tone signal with the resonator included a button on the steering wheel, and additional, optional, powerful pneumatic dual-tone warning signal located on the roof and turn on the button under the driver’s foot. Internal audible signal mounted in the driver’s cab, was carried out by one-way communication with the conductor, which could be anywhere in the interior (along the ceiling was stretched a rope). In addition, the audio signals supplied to the driver at various bus faults (overheating of the water in the cooling system, open the emergency door), light signals abnormal functioning of different brain systems (“no charging”, “no lube”, “door open”, etc.). In General, the bus had a high, unprecedented level of comfort and facilities for passengers and service crews. Bus body (model VMS-190) — all-metal bearing (frameless). The power base of his frame of duralumin shaped extruded sections. Spars was carried out in a box of riveted construction. Contacted them cross the farm with diagonal braces. The sidewall of a steel U-shaped uprights with the frames connected to the longitudinal belts and exterior aluminum cladding with the base in a single structure, the rigidity of which provide for a sufficient “building height” of the body. Front and rear were lined with sheet steel, fastened with aluminum rivets to the frame. The roof and the lower part of the front edge of the body of sheet aluminum. The floor was covered with water-resistant aircraft plywood thickness of 15 mm. Engine yaz-204D — cylinder two-stroke diesel liquid cooling direct fuel injection pumps-injectors), with the valve-slit blowing and rotating blower type roots. Having a small volume (4,654 l) with a fairly large weight (790 kg), he was distinguished by compactness, rationality and thoughtful design. However, its high for the diesel engine liter capacity (24 HP/l) led to large thermodynamic and mechanical stresses in the structural members. For reliable and durable operation in the prototype — engine GMC-4-71, this required special materials, high manufacturing quality, the use of special fluids and fuel, thorough and highly skilled maintenance. Because these requirements sometimes were not met, the reliability of the diesel yaz-204D of the first years of issue in the operation left much to be desired. However, engine performance was a perfect match when working with the power generator at a constant speed close to the maximum. To improve the working conditions of a diesel engine was used for a number of new nodes: the surge tank of the cooling system, automatically controlled pneumatic shutters of the radiator, stop the engine by an electromagnetic actuator. Especially important was the introduction of remote emergency shutdown systems, as two-stroke engines of this type when failure of the regulator and at oil getting into the combustion chamber (yaz-204D had forced oil cooling of the piston crown) had to “dressing”, because with increasing frequency of rotation is increased the fuel supply, and improved scavenging of the cylinders. The engine was equipped with a powerful compressor, pneumatic liquid cooled heads, dual mesh oil purifier, used to increase flow into the engine, dynamic pressure of the oncoming air flow, two stage silencer exhaust (not effective enough) and kilowatt lighting generator G-52A. Fuel tank capacity 270 l (full filling enough for a few shifts) supplied with a level indicator. Almost all motor control devices were placed on the back panel of the engine room. From there, if necessary it was possible to start the engine using the electric starter. With the flywheel housing rigidly docked to the housing of the power generator DC 505A. The front part of his armature was connected to the engine flywheel through a semi-rigid plate clutch and centropolis with podarennoe support. The rear part of the anchor rested on the spherical bearing. The output shaft of an anchor was set (through the rubber dampers) shestilopastnye the cooling fan and pulley lighting generator. The power unit Assembly is attached to the base of the bus at three points through the rubber feet. Power generator — four-pole, direct current, compound, with weak seriesname excitation, self-ventilated. Developing voltage is 190 V, the clock current — 266 And maximum is 600 A, the power is 50 kW. Generator weight — 425 lbs. While parked the bus in a stationary mode was possible external electricity consumption from the running power plant. Traction motor DC-305A power of 43 kW four-pole, sequential excitation, self-ventilated, installed under the floor of the body on rubber mounts. Its mass is 470 kg. it Should be noted that the mass of electrotransfection was still too big for a city bus. For the maintenance of the electric transmission system was introduced throw switch (Rev. ), current relay, voltage relay, power resistance switch (for urban and extra-urban modes), the switch circuit feeding the fuse. The transmission was controlled only by the pedal fuel supply. The motor with a single propeller shaft ZIS-120 with two joints on needle bearings was associated with a two-stage rear axle different from the axle of a truck ZIS-150 is basically a ratio (of 8.39 instead of 7.63), track width and in places of fastening of springs. The front axle is also fundamentally like the axle of ZIS-150, but was reinforced, is provided with pivot thrust taper roller bearings, although less durable than sleeve bearings, but to facilitate the control, as well as expanded in accordance with increase in the gauge of the front wheels. To improve the maneuverability of the angle of rotation is increased to 38 degrees. Suspension bridges classic: four longitudinal semi-elliptic leaf springs with threaded joints on the fingers and sleeves. On the front axle was equipped with two reciprocating hydraulic shock absorbers from a car and ZIS-110. Bus and trolleybus, model I-6, 10.5—20″, dvenadtsatistrunnye, with high internal pressure (in the front — 6 atmospheres, in the rear and 4.5), “on-road” tread pattern. Steering without the amplifier, using the steering mechanism ZIS-120 (“globoid worm — triple roller”). 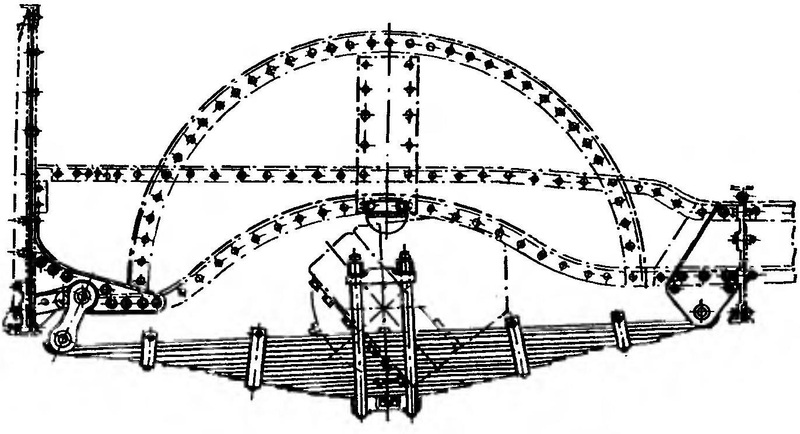 To facilitate the work of the driver, other than installing the pivot bearings, were used increased, “bus” steering wheel with a diameter of 550 mm. Brake — Shoe on all wheels with pneumatic drive. The brake drum diameter 420 mm (maximum to be placed in these wheels). “Squeak” of the brakes (of brake drum vibration) in the process of exploitation is not resolved. To improve the reliability of the brake system has two air cylinder (receiver). Hand brake — Central (acting on the transmission), disk, with internal ribs for cooling mounted on the flange of the armature of the motor. In exceptional cases serve as emergency.